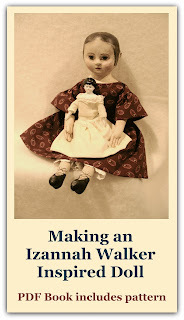 Izannah Walker Chronicles: Thank you, Lone Pierette! Original Izannah Walker Doll "Thankful"
Oh, what fun to get up at 6 a.m. and see an e-mail from Denmark telling me of an Izannah doll in a museum for the Museum and Shop list. You can see that the list has been added in the right side-bar. Thank you, Lone Pierette, for giving me the beginnings of this list! Lone is a wonderful dollmaker and a great encourager. Keep those cards, letters and e-mails coming, everyone! Together we can put together a great list of where Izannah dolls are. The beauty above can be seen at The Doll Museum at the Old Rectory which is located at 50 West New England Avenue in Worthington, Ohio. 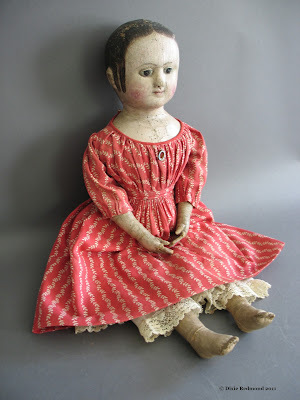 Their site says, "The museum features a distinguished collection of 19th and 20th century dolls including Parian bisques, French fashion models, milliner's models, French bebes and portrait dolls as well as American dolls by Ludwig Greiner, Izannah Walker, and Joel Ellis." Oh, be still my heart! is another place where you can see an Izannah doll. The Museum reopens on May 18th. Hello Lone. Have you taught Louisa to speak Dansih yet? oops, that's "Danish" not Dansih. Hi Teresa - oh yes she speaks very well , the other dolls even taugh her to swear ! Such wonderful info, Thank You Lone and Dixie!! Lone what a beautiful IW doll!!! Thanks Jackie - I looove your dolls ! I have to love you ! I so enjoyed looking, and I don't even own an Izannah Walker, but they are wonderful. So nice to hear a name from the past, Lone and Dixie. Come over for a visit. Hello everyone. When The Shelburne Museum opens in May I will be heading there with my camera in hand. I will se what photo's I can get! There is so much great information here..I love visiting.